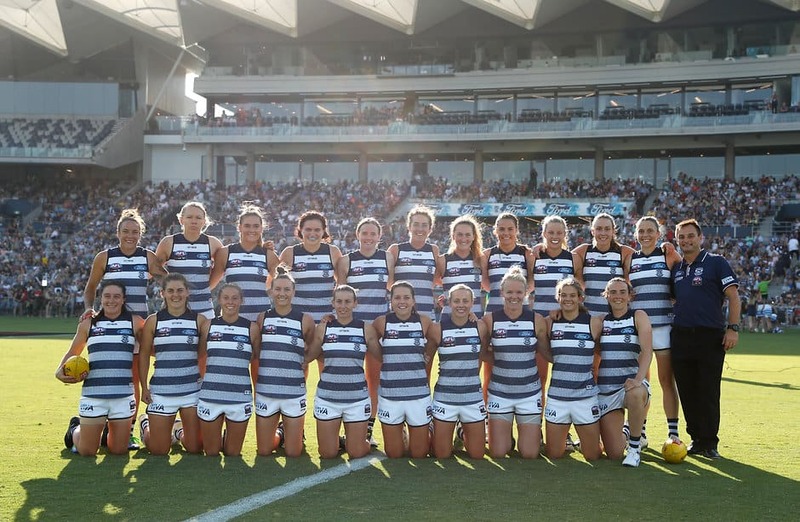 Geelong pose for a photo in the club's first AFLW match against Collingwood. It was the first season of many. Geelong will be a part of AFLW for years, decades, hopefully centuries to come. But never again will there be so many firsts. The inaugural season for the Geelong Cats saw their playing group achieve a number of accolades for the first time. There was the first time AFLW players donned the blue and white hoops. The first ever game in Geelong in front of a staggering 18,000 fans. Geelong local Maddie Boyd kicking the club’s first ever goal. Maddie Boyd celebrates kicking Geelong's first ever goal with teammate Sophie van De Heuvel. Each achievement cementing itself in the proud history of this club now in its 160th year. As the season has now come to a close, it’s the perfect time to reflect on some firsts that were achieved in the club’s exhilarating and turbulent debut season. Of course, when looking at firsts the number one comes to mind. When I think of number one, I think of 17-year-old Nina Morrison taken at number one in the 2018 draft. The first ever Geelong player taken in the draft. Number one draft pick Nina Morrison with Coach Paul Hood. I think of Nina and her debut in Round 1, the club’s first ever game where she kicked the winning behind and had 22 possessions, becoming the first Cats player to be nominated for the NAB Rising Star. Another Rising Star, Liv Purcell was nominated in Round 5 where the club had its first interstate win against the Brisbane Lions, arguably the team’s best win of the season. Geelong celebrate their first interstate win against Brisbane. The NAB Rising Star was presented at Tuesday’s W Awards, where this year’s All Australian team was announced. Meghan McDonald is the club’s first All Australian representative after a breakout season. The All Australian side featured a number of Adelaide Crows players who the Cats played against in their first ever final. The Preliminary Final held at Adelaide Oval will provide girls with an invaluable experience to prepare them for years to come. Last weekend’s grand final held at the same venue saw a record crowd of 53,034. This is the largest crowd the AFLW has seen, showing that clubs in their third season are still experiencing things for the first time. In a league so young, for a team so new, records will continue to be broken and players will continue to be the first to achieve new and amazing heights. Firsts are exciting but the best is yet to come.